Although the ‘starter’ type lenses found in camera kits are generally good-performers, Sigma’s hoping potential purchasers will either be tempted when ordering their new camera body or maybe even replace their existing 18-55mm kit lens with this faster (brighter) model. Although this recently upgraded zoom shares a similar cosmetic appearance to the firm’s Art-series this new model is the first of the new general-purpose Contemporary line. As well as a revised exterior, it features a modified optical construction consisting of 16 elements arranged in 14 groups. Like its predecessor it has has a sonic-type AF motor and focuses to a minimum distance of 8.67” (22cm) and a maximum magnification of 1:2.8. However, with a 72mm filter thread and 3.1” (79mm) maximum diameter and an overall length of 3.2” (82mm) it’s smaller and lighter (at 16.04 oz / 465g) than the lens it replaces. It’s available now, with a $30 premium over the model it replaces, at $499. 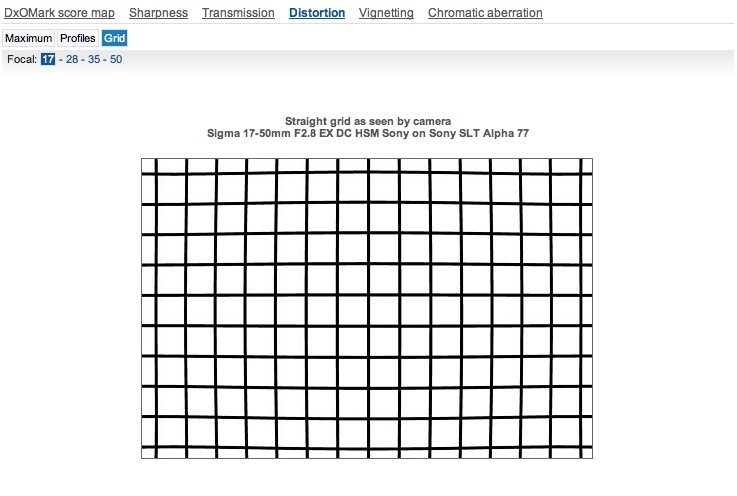 Mounted on the Sony SLT A-77, the Sigma achieved a DxOMark score 14 points, a pretty good score overall though the 8P-Mpix sharpness score is on the low-side. 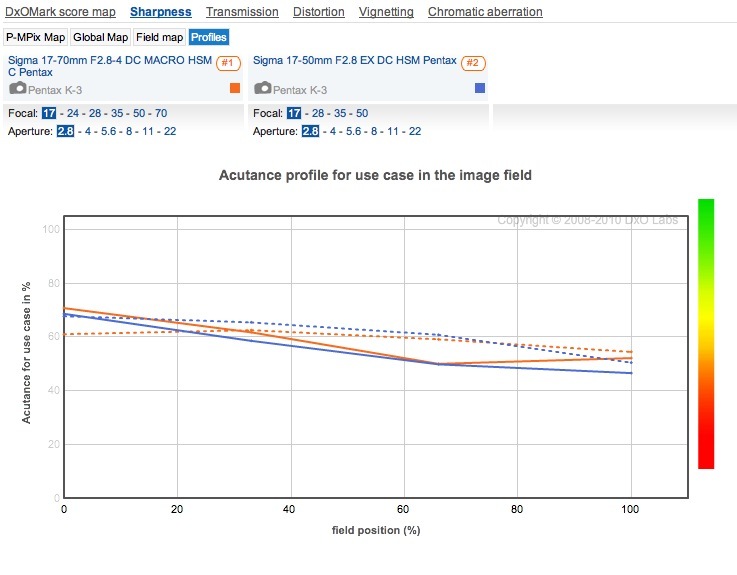 However, while the peak sharpness value is the same as the earlier version, Sigma has made improvements to the sharpness in the outer field – one of the weaknesses of the previous iteration. Some slight barrel distortion is noticeable at 17mm but that, vignetting and chromatic aberration are all well–controlled. 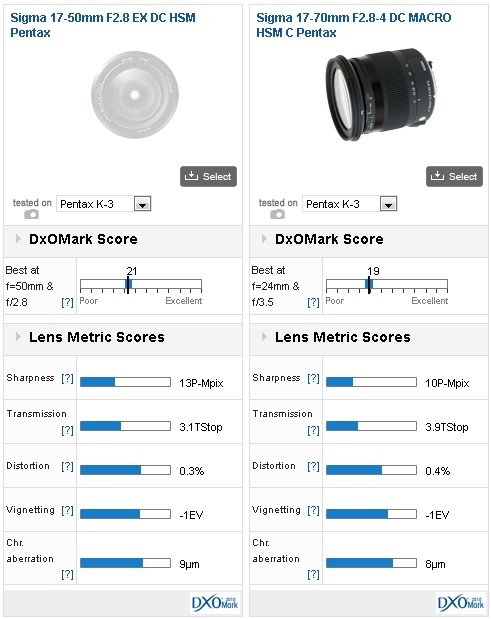 The Pentax mount version of the same lens performs similarly except for the higher-peak sharpness of 10P-Mpix, in fairness we suspect mostly as a result of the sensor (testing with the Pentax K-3 was performed without the simulated AA filter in operation). Gains in sharpness aren’t uniform across the field but rather in the center at 17mm although there’s a noticeable increase in sharpness across the whole frame at every other focal length. 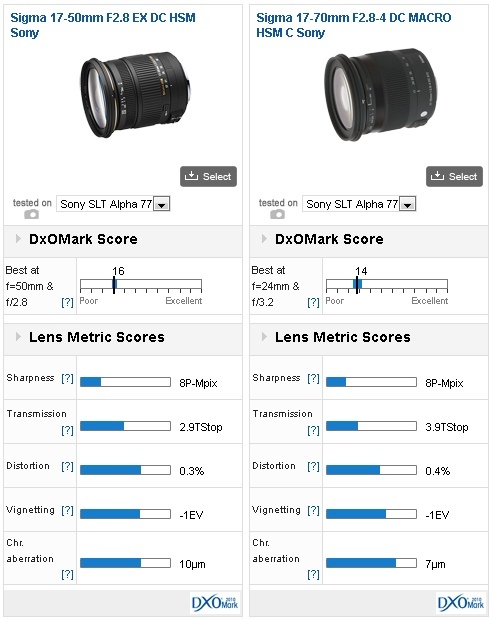 Unsurprisingly, the lens shows similar levels of distortion, vignetting and CA – the latter slightly more prevalent at 70mm wide-open than the Sony mount version. 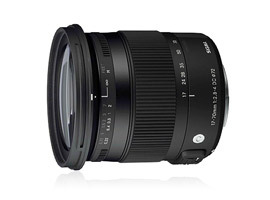 There are few rivals in this category but the closest is arguably from the same company, the Sigma 17-50mm (26-77mm equivalent) f2.8 EX DC HSM. This model has a shorter range zoom but it has a constant f2.8 aperture and a $120 premium. 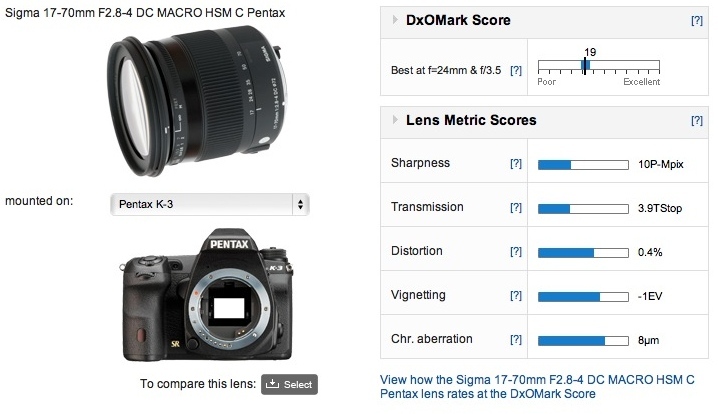 Although it sounds promising and while it achieves a slightly higher ranking, peak sharpness is practically identical. Although close, it can’t quite match the 17-70mm wide-open at 17mm for sharpness across the frame but once stopped down to 5.6 they have similar sharpness, particularly in the outer field. Performance at 50mm f4 is good – it’s sharper centrally than the 17-70mm wide-open (at f4) but, similarly, the outer field isn’t terribly impressive until stopped down. It also has less vignetting overall but chromatic aberration is more evident, particularly in the corners at 50mm and distortion is bordering on the more troublesome complex (moustache) type at 17mm. On the Pentax K-3 the story is quite similar. Indeed, the two are very closely matched in sharpness and uniformity at the wider end. Both have good central sharpness wide open at 17mm, but the 17-50mm f2.8 has better uniformity when stopped down. Corner sharpness on the 17-70mm is lacking at every aperture at 17mm. Uniformity improves throughout the zoom range, though, with the lens showing significant improvement in the outer field from 28mm through to 70mm. 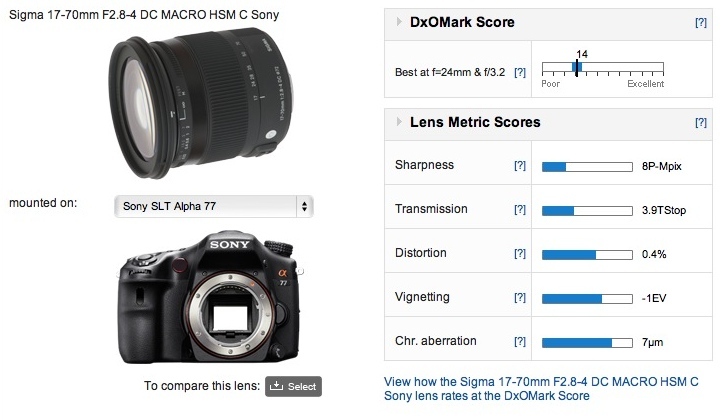 Peak sharpness, however, is higher overall on the 17-50mm f2.8. In most other respects the 17-50mm f2.8 performs in much the same way as it does on the Sony, with slightly higher lateral chromatic aberration at 17mm along with a trace of waveform distortion. Anyone looking for a ‘standard’ zoom to replace their starter lens from a camera kit should consider this model. It’s modestly-priced and well specified. As for image quality, it’s a good performer overall, particularly at the longer focal lengths where the extra range over the usual 18-55mm kit models is genuinely useful.